Westover Farmers Market, 1644 N. McKinley Road & Washington Blvd. Arlington Friends of Urban Agriculture invites you to our next public meeting at Ashlawn Elementary School (5850 8th Road N, Arlington) on Thursday, April 11th, 6:30-8:30pm. The theme of the event is “Growing the Next Generation of Urban Farmers”, an in-depth discussion on future urban farmers in the area and how children, students, families, teachers, schools, PTAs, and communities can increase local food production and consumption. We will have panelists leading a discussion on student involvement, nutrition, and comprehensive curriculum development. We will also have hands-on activities for children and young families. We hope to you can join us, and if possible, please share this event with your members and colleagues. If your organization would like to setup exhibits or provide brochures/pamphlets, we’d be happy to display them for you. Email matt@bushelediblegardens.com. The Arlington County Board must reduce costs for it’s FY2020 budget. The county’s Urban Agriculture program could be cut. Last December we had a celebration of our accomplishments over the past 5 years. Let’s raise our voices now to show there is robust support for prioritizing a coordinated food sustainability program and our exciting, emerging urban agriculture industry. Climate change challenges bring urgency to our government addressing these priorities. The Urban Agriculture Program’s mission is the advancement of the County-wide goal to improve access to healthy, fresh and sustainably produced foods in Arlington. Created from the 2013 Urban Agriculture Citizen Task Force recommendation, the Urban Agriculture Program synchronizes management of Arlington’s community gardens and farmers markets, conducts outreach and education, and coordinates activities with Virginia Cooperative Extension agents. Additionally, the program provides liaison between Arlington’s burgeoning agriculture start-up businesses and County officials. Friends of Urban Agriculture believes that the time is right for the County to become a national leader in this emerging economic sector and to address climate change realities. Instead of shrinking, the County should seize this opportunity to support and expand this vital program that enhances Arlingtonians’ health and quality of life and advances environmentally-sustainable food access and food production throughout the County. CLICK HERE to send an email to your County Board members and the DPR. Or cut and paste and customize the letter template below and send to the County Board. Watch the County Board's Work Session on March 12 on the Department of Parks and Recreation's proposed budget. Attend the Public Hearing on the Budget April 2 at 7:00pm. Forward this email to 5 of your friends! I recently learned of the proposed FY2020 budget review and am concerned the Urban Agriculture Program is at risk of elimination. As a patron of Arlington’s vibrant local food ecosystem, I am worried that budget cuts to the Urban Agriculture program will mean ongoing programs will become decentralized and reduced to minimum maintenance levels. In addition, staff and policy support for expansion and innovation in the urban agriculture business sector will be stopped. I request you reconsider proposed budget cuts to the Urban Agriculture Program. I am a proud supporter of Urban Agriculture and believe in its ability to simultaneously advance Arlington’s progressive vision, promote public health, improve our local food system, expand food access, increase environmental stewardship, and promote economic development in the County. Instead of shrinking, the County should seize this opportunity to support and expand this vital program and recognize the time is right for the County to become a national leader in this emerging economic sector and to address climate change realities. At our December 12, 2018, meeting, we explored the progress made in the past five years since the County issued its Urban Agriculture Task Force Report (we’ve made a lot progress – read our blog). We then looked toward the future. Arlington Friends of Urban Agriculture’s Board of Directors spent time this year defining our vision, mission and strategic goals. We also identified our work for 2019. We envision our work in three phases: Seed, Nurture and Grow. This year is our Seed year as we further refine our areas of work and build our organizational capacity so we can undertake our ambitious mission and agenda. As you read through this blog, ask yourself – how can I help – and then contact us! Assess the 2019 status of public, community and for-profit Urban Agriculture initiatives. Ø Identify opportunities for further development and make recommendations. Ø Research best practice regulatory and structural requirements for establishing urban agriculture enterprises. Ø Participate in the County’s updating process for the Forestry and Natural Resources Master Plans. Ø Host at least four meetings each year. Our target is two educational and two interactive meetings. Ø Increase membership and outreach, focusing on key issues for residents, businesses and other stakeholders. Ø Expand and improve communication. Ø Create an organizational model to support initiatives, including establishing FOUA as a non-profit organization. 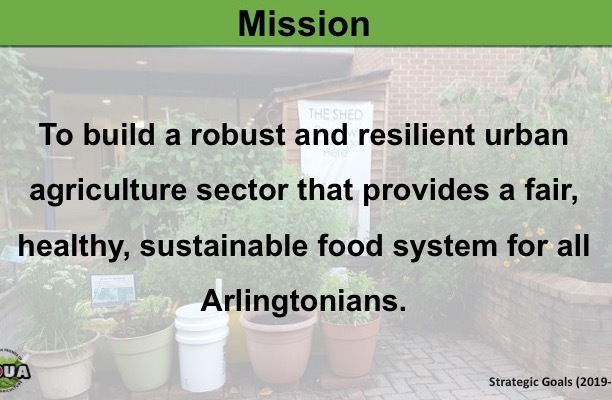 Ø Build community interest in expanding Arlington’s urban agriculture sector and transforming our food system by engaging members and consumers to think about what we eat and the way food is produced. Ø Promote urban agriculture business development and a hyperlocal food chain. Ø Advocate on urban agriculture and food policy issues. Ø Identify and help fulfill gaps in the urban agriculture sector. Ø Partner with Arlington County to implement best practices for urban agriculture such as regulations, incentives, incubating startups in the county. Ø Build on our foundations of activities, collaborations and research to establish a secure and equitable local food system. Ø Leverage existing county work to implement climate and carbon mitigating plans. At our December 12, 2018, winter meeting, we asked County Board Member John Vihstadt who chaired the County’s Urban Agriculture Task Force 5 years ago, and Kim Haun, Urban Agriculture Coordinator, to give us an update on how far we’ve come since the Urban Agriculture Task Force report issued in 2013. The County recognizes that we are part of a regional food system, and while they focus on what we can do here in the County, they also coordinate and collaborate with regional partners. A robust and sustainable local food system builds a strong economy and community. A responsible food system supports other values like environmental sustainability, social equity and improved health of the participants. There were 276 community garden plots in 2013, and with dividing some larger plots and adding an additional 70, we now have 380, with at least that many still on the wait list. The County splits large plots when the original holder vacates and then assigns to two new plotholders to help address the lengthy waitlists. The County is in the process of automating the waitlist. There are still 7 community gardens, the County expanded two. Each plot represents at least 3 – 4 people and they feed not only their own families but contribute thousands of pounds of fresh produce to AFAC. The County built the first ADA compliant community garden plot in the region at the Lang Street Community Garden. This plot features a vertical garden structure, a concrete pad and driveway access, on-street handicapped parking and an in-ground planting border. DPR staff identified and secured a letter of intent with Service Source, Inc., a local non-profit providing services to disabled adults, to maintain the plot. The community gardeners have welcomed them and are including them in communal activities and responsibilities. We have 11 neighborhood supported farmers markets, six of them have robust SNAP matching programs. On a single Saturday in one market during the prime season we may get as many as 3000 people attending. The County Board approved a special use permit for two new farmers markets in 2018. The market at Arlington Mill Community Center, run by CPRO, serves the west end of Columbia Pike. The community around Lubber Run supported the addition of the County’s eleventh market located in the parking lot of Barrett Elementary School. This market is run by the nonprofit Field to Table. Arlington Farmers Market at Courthouse, managed by Community Foodworks, Inc., led the efforts through Virginia Fresh Match to collaborate with 4 other Arlington markets and others in the region to win a USDA Food Insecurity Nutrition Incentive (FINI) grant fund SNAP matching for the next three years. The other markets participating include the Rosslyn, Crystal City, Ballston and Arlington Mill farmers markets. Columbia Pike has other matching funds. For every $1 in SNAP benefits a shopper spends, they receive an additional $1 to spend on fruits and vegetables. AFAC’s Plot Against Hunger Program, a project that seeks to bring fresh produce to AFAC clients from local farmers, gardeners, farmers markets, gleaning organizations and other sources. Since it started in 2007, it has grown to 29 schools, 20 churches, fifteen community-based gardens, eight farmers markets, three CSA (community supported agriculture) groups, three gleaning organizations, as well as numerous individual gardeners. Since its first season in 2007, over 600,000 pounds of fresh produce have been donated to AFAC’s Plot Against Hunger project. In 2018 alone, AFAC volunteers picked up 55,282 pounds of farm fresh produce for needy families in Arlington. Of the current 11 farmers markets, 6 have matching SNAP benefits. These are dollar for dollar additional funds for SNAP shoppers. These funds are supplied by a collaborative USDA grant and their own fundraising efforts. You can donate to these funds by checking the markets’ websites or stopping by their manager’s tables at the market. This program helps make our wonderful markets affordable and accessible to everyone in Arlington. The many public education classes offered by the Virginia Cooperative Extension and taught by trained volunteers are always well attended. They have 250 Master Gardeners and 143 Master Food Volunteers who teach you how to grow, cook and preserve your food. Our public schools and libraries have gardens maintained by students and volunteers. Each of these has extensive education programs. For example, Central Library holds free Garden Talks throughout the season at the AFAC demonstration garden. You can also find the Garden Tool Lending Shed at Central Library where you can borrow garden tools with a library card. Our local universities – Marymount, George Mason, Virginia Tech – have urban agriculture programs and/or extra-curricular activities. Moving forward, there are many opportunities to look beyond the basic community garden/home garden model. Areas for development include rooftop, indoor, and edge gardening. Further encouragement of farm to institutions such as hospitals, universities and schools will help build a commercial demand for locally produced food. Examination of potential barriers to agriculture in our urban community such as availability of capital, regulatory issues and transportation infrastructure may warrant further effort. The pilot rooftop garden at the Department of Parks & Recreation (DPR) Trades building located at 2700 S. Taylor Street had a successful second season. All the hardware required was recycled from previous park projects. A team of DPR Staff managed this garden and learned how the high wind and heat impacts a successful garden. DPR is working to open the rooftop for public visits. Arlington Department of Human Services examined regulations related to inspections for small food producers, such as those found at our farmers markets, and modified county policy to comply with the less restrictive State code. DPR staff supported Zoning and AED to make a determination on a Certificate of Occupancy for an indoor urban farm, Fresh Impact Farms, located on Lee Highway. DPR staff is working with another new business, Urban Farm Greens, that is setting up in Rosslyn. For years, the County has supported the addition of green roofs on buildings. You can see examples at Walter Reed Community Center, DPR’s Trades building, and the Bozeman Government Center at Courthouse Plaza. These installations, that can include vegetable gardens, qualify for LEEDS credits. County staff visited several rooftop gardens and farms this past summer to learn more about them. They saw different design concepts and management models. The staff is going to reach out to local property owners and developers to share what they have learned and to talk about what is possible here in Arlington. The multi-family residential building at 3110 Tenth St N, called Ten at Clarendon is a luxury building offering a rooftop garden and lobby market as amenities. The rooftop design has raised bed vegetable gardens as well as social and entertaining space. The garden is managed by Love and Carrots. A 40 cubic-yard container was installed at the Department of Environmental Service’s Solid Waste Bureau to convert food waste into compost. Food waste is collected from Abingdon Elementary School, AFAC, the Fairlington Farmers Market and Columbia Pike as well as private citizens and County special events. This is mixed with leaf waste and is converted from 16 tons of raw material to 5 tons of compost. The Arlington Friends of Urban Agriculture (FOUA) established its inaugural Board of Directors in 2017. FOUA hosts quarterly public educational events, and in 2018, its first social hour at Trade Roots in Westover. A 30 people attended on a very rainy night. FOUA Board members led informal conversations about what people want to see happen in Arlington to further urban agriculture. FOUA also maintained a website, Facebook page, Twitter and Instagram, and an email list of over 340 names to share information about resources, news and upcoming programs. For the second year DPR staff and FOUA partnered with Marymount University student club, Food for Thought, to grow basil seedlings, and conduct a giveaway event for metro commuters at the Ballston and Courthouse Metro stations. DPR staff with FOUA hosted a table at the County Fair, including a demonstration on growing microgreens. DPR and FOUA encourage community gardeners to enter their produce and homemade products in the County Fair’s competitions. This is a fun way to draw attention to all the wonderful vegetables Arlingtonians are growing. It gives us great pleasure to present Puwen Lee with our first annual Golden Radish Award, recognizing her extraordinary contributions to growing urban agriculture in Arlington. Puwen was an original member of the Arlington County Urban Agriculture Task Force, and is an Arlington Healthy Community Action Team member and a Master Gardener. Most people know her work at the Arlington Food Assistance Center (AFAC). Puwen joined AFAC in 2005, first as a volunteer and later as the head of the Volunteer Department. Since 2014 she has served as Associate Director of the AFAC Program Division and manages AFAC’s Plot Against Hunger Program, a project that seeks to bring fresh produce to AFAC clients from local farmers, gardeners, farmers markets, gleaning organizations and other sources. Since she started the “Plot” program in 2007, it has grown within Arlington area, to 29 schools, 20 churches, fifteen community-based gardens, eight farmers markets, three CSA (community supported agriculture) groups, three gleaning organizations, as well as numerous individual gardeners. Since its first season in 2007, over 600,000 pounds of fresh produce have been donated to AFAC’s Plot Against Hunger project. In 2018 alone, AFAC volunteers picked up 55,282 pounds of farm fresh produce for needy families in Arlington. She spearheaded the creation of a schoolyard garden at Ashlawn Elementary School, a garden which has become integrated into the school curriculum and which donates fresh produce to AFAC. She also played a pivotal role in the creation of the Central Library garden, without which there would be no garden talks, and no tool lending library. If you have had the pleasure of working along side this incredible garden leader, you will know that she can tackle the smallest garden chore to the most complicated logistics challenges. We cannot think of another person that will time and time again rise to the moment with passion in her heart and a smile on her face. FOUA Social Hour, Thursday, Sept. 27, 6:30 – 8:30pm at Trade Roots in Westover. RSVP today! Visit www.arlingtonurbanag.org and our Facebook page for details and to RSVP! Our extremely popular Potting Kit Giveaway is back for a second year. Arlington Friends of Urban Agriculture has teamed up with Marymount University again to promote gardening in small spaces. With assistance from Rooftop Roots, students started basil seedlings and on April 25th will distribute Potting Kits to lucky commuters at the Ballston and Clarendon Metro stops. For updates on the Potting Kit Giveaway, go to our Facebook event page. In addition to promoting gardening in small spaces, Rooftop Roots built raised beds on Marymount University's campus, which will be maintained by Marymount's Food For Thought campus group. This garden is a Plot Against Hunger plot and the produce will go to AFAC families in need. The Marymount Farmers Market, a local producer-only market, opens for the season on May 26th. Each of the vendors grows, bakes, roasts, cooks, or prepares all of their products within 125 miles of Arlington County. Where: Marymount University surface parking lot, near the intersection of Glebe Rd. and Old Dominion Dr. Follow Marymount Farmers Market on Facebook.